This handbook and ready reference covers materials science applications as well as microfluidic, biomedical and dental applications and the monitoring of physicochemical processes. 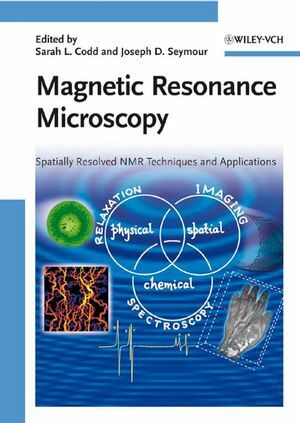 It includes the latest in hardware, methodology and applications of spatially resolved magnetic resonance, such as portable imaging and single-sided spectroscopy. For materials scientists, spectroscopists, chemists, physicists, and medicinal chemists. Sarah Codd is co-director of the Magnetic Resonance Microscopy (MRM) laboratory and an Assistant Professor in the Department of Mechanical and Industrial Engineering at Montana State University. Her research focuses on technique development, spatially resolved studies of gas in ceramics, flow and diffusion studies in porous media, and investigation of fluid dynamics in hydrogels, biofilms, cellular suspensions and polymer electrolyte membranes. Her doctoral studies were at the University of Kent at Canterbury, UK. She held post-doctoral positions at Massey University, New Zealand, Ulm University, Germany, and New Mexico Resonance, USA, before moving to Montana in 2002. Joseph Seymour is co-director of the Magnetic Resonance Microscopy (MRM) laboratory and an Associate Professor in the Department of Chemical and Biological Engineering at Montana State University. His primary area of research interest is in transport imaging using MRM. Prior and future research includes laboratory and field studies of transport phenomena using MRM's ability to measure both coherent motion, or velocity, and random motion, or diffusion. His doctoral studies were at the University of California at Davis, USA. He held post-doctoral positions at Massey University, New Zealand, Universität Ulm, Germany, and New Mexico Resonance, USA, before moving to Montana in 2001.